First, let’s get you motivated by looking at how an organized pantry pays off. You’ll save money by reducing food waste and more easily identifying what you do – and don’t – need to buy. You’ll save time, finding what you’re looking for and making grocery lists quicker. An organized pantry can also help you better understand or change your eating habits and meal planning. You might even find those meals tasting better because you’re working with fresher ingredients. Start your pantry makeover by taking everything out of it (the perfect opportunity to wipe down your shelves). For each item, check if it’s still “good”. If not, toss it. Be wary of dates on packaging, though – they’re not necessarily expiration dates – and expiration dates aren’t necessarily gospel. Don’t waste money throwing out perfectly good food. On the other hand, some foodstuffs, like spices and seasonings, don’t ever spoil but do lose their potency, at which time they should be tossed as they won’t do your meals any favors. Next, check if the remaining items will be used. If you haven’t used it in the last year, the answer’s likely no. Donate tthe unopened items to your local food bank. What’s left is ready to be restocked in your pantry. But how and where you put everything back is key to realizing those benefits we talked about. Grouping similar items together (e.g., condiments, baking ingredients, canned goods, and grains) helps you find what you need faster and to see how much of an item you have available. Placing your most frequently used foodstuffs in prime pantry real estate (at eye level) saves time. Strategically placing certain items, like snack foods, where they can’t be easily seen or reached can help you with your eating habits. Ordering items by expiration date (the first to expire should be the last put away) helps reduce waste. Having purged your pantry, you might find you now have all the room you need. But if it’s still cramped and you’re having trouble accessing or even seeing everything, take advantage of the many kitchen-organizing products available, from under-shelf storage to Lazy Susans to door-mounted racks. Take food out of original packaging and put it in stackable, square or rectangular storage containers to maximize space. If those containers are also clear and air tight, you’ll be able to see at a glance how much product you have left and your food will stay fresher longer, saving you money and making your meals taste better. 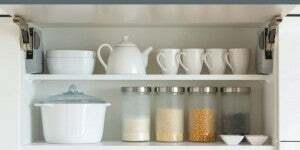 Keep your new-and-improved pantry organized by going through it on a weekly, monthly, or seasonal basis – whatever works given its size and your household’s food- consumption habits – taking out what you won’t or can no longer use, and regrouping contents.